We build strategic websites - We believe we're as good as the people we hire. We provide professionals to guild you , help you through all your choices and what works for you. we are reliable, affordable and creative. From your first meeting with the geeky boys an experienced marketing professional is involved guiding you through your choices and direction of your website of color, theme and fine tuning your compelling market message, asking you about your target customer, helping you with your slogan and much more. Our professional copy writers will either write, edit proof read your copy that is build in all our packages. We believe in strong design with the user in mind. We use cutting edge technologies and studies that tell use how users interact with sites. And of course the web design usability guild-lines. Our Graphic designers will your customize or design from scratch your websites, brochures, business any graphic elements for you may need . Even though all our sites are build with SEO (search engine optimization) in mind , advanced website optimization requires seo engineers to utilize web technologies responsibly ( not to be black listed and banned by search engines) and stay ahead of the constant changes by search engines and copy writers to legitimately enhance your web presence. From blog posting, article writing, press release writing and submission and social media optimization to push your website higher on the search engines. 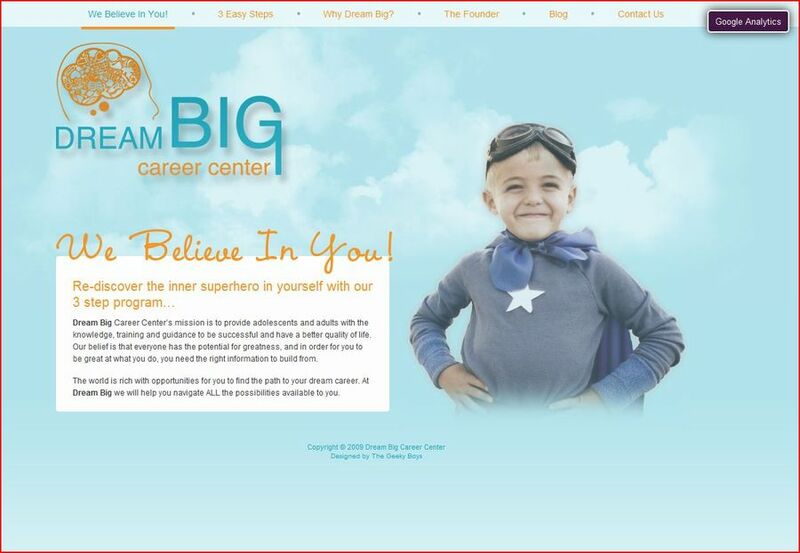 Screen shot of website redesign & branding for career center in Los Angeles.